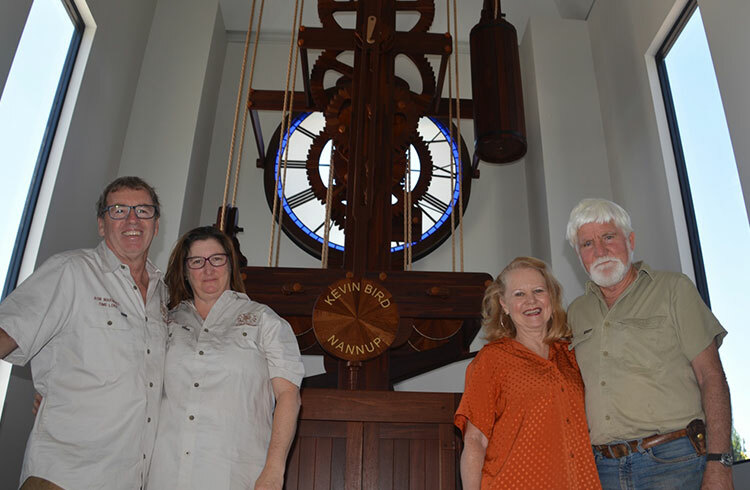 The Nannup Clock Tower building was purpose-built to house the six-metre-high wooden pendulum clock created by master clockmaker Kevin Bird. The dream of bringing this experience to the main street of Nannup has been a long time coming, but with the continued efforts of a determined few, has now been realised. The aim of The Nannup Clock Tower and An Experience in Time is to introduce visitors to the delights of timber craftsmanship at it’s finest and to honour the forest and its majestic trees from which this magnificent clock was built. (L-R) Rob Marshall, Heather Walford, Margie Bird, Kevin Bird. Kevin was a retired aircraft engineer when he decided to build his own home out of wood. This started a lifelong love of working with timber, which together with his passion for clocks led to the ambitious dream of creating the world’s largest wooden pendulum clock. Kevin is a natural storyteller and your tour guide on the Meet The Clockmaker tour. Margie’s enthusiasm is infectious and her determination unwavering. She is the glue that has held the Nannup Clock Tower project together and made sure it got over the line. An avid gardener and artist, Margie has brought her special brand of creativity to The Nannup Clock Tower project. Rob is a retired maintenance supervisor who loves tinkering with machines and solving problems. Born in Busselton, the son of a dairy farmer, Rob is keen to share his wealth of knowledge of the region with visitors. Known locally as Rob Everywhere, he really is the ultimate time traveller. Heather has a flair for thinking big and getting things done. One of her successes is the Nannup Lavender Farm, which she built from scratch on a rocky paddock outside Nannup. Heather’s determination and organisation skills make her a great person to have on the team.